A bacchante is a follower of Bacchus, the god of the grape harvest, winemaking and wine, of ritual madness, fertility, theatre and religious ecstasy. The bacchante Ter Bruggen painted seems to be in a (mild) drunken state. 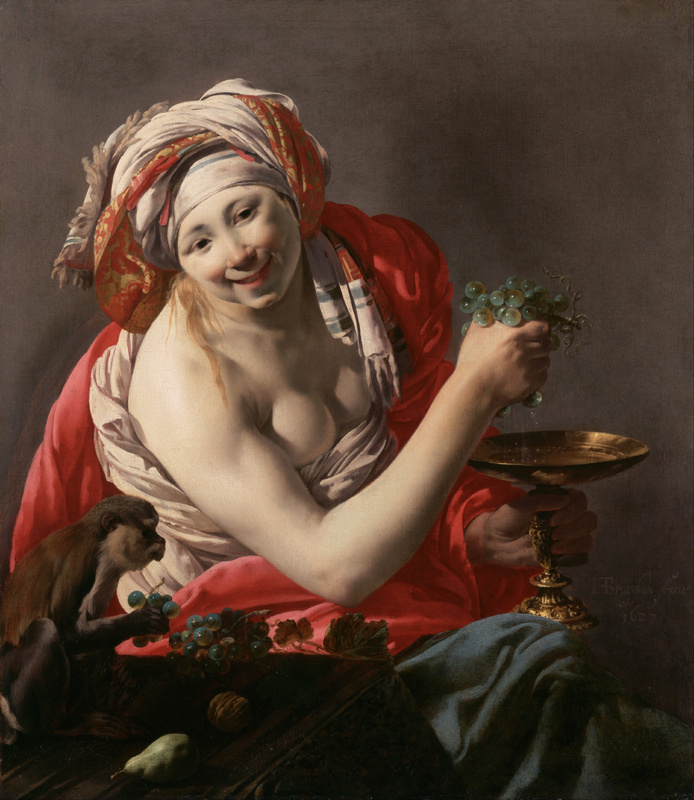 The grapes in her left hand are being squeezed out in a golden cup. Her breasts are almost exposed, her cheeks flushed, and with a broad smile on her face, she leans towards us, the viewers. Like his fellow painter Dirk van Buren (who we saw a couple of days ago), Ter Brugghen belonged to the Utrecht Carravagisti. Although he probably had seen Caravaggio’s Bachus when he visited Rome, Bacchante with an ape differs both in painting style and the depiction of the subject (she certainly doesn’t resemble a goddess, while Caravaggio’s Bachus did look like a god). Three symbols associated with drunkenness & vide: an ape, a walnut and a pear. 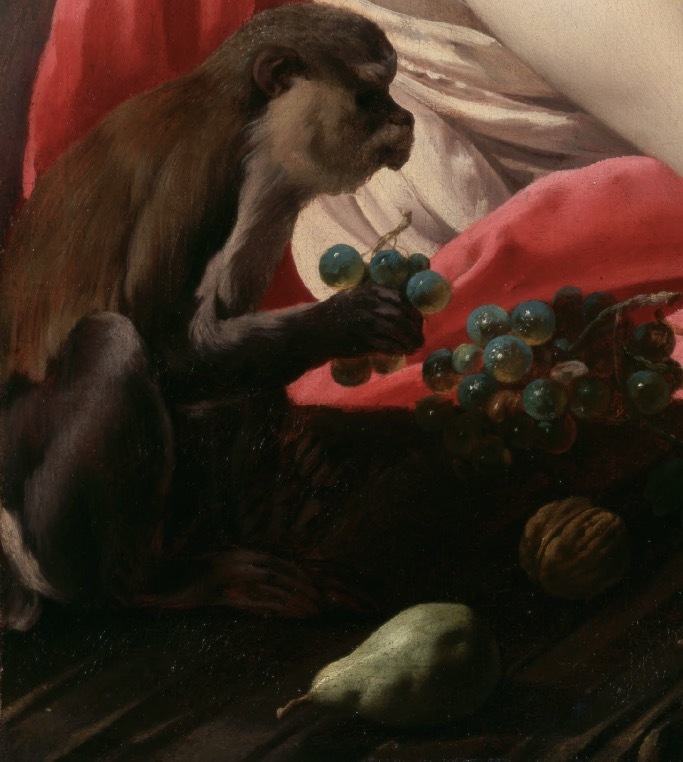 The ape in the lower left corner mimics her behaviour; squeezing out the grapes. Since the middle ages, apes were associated with drunkenness (and with Bachus). The walnut and the pear are also interpreted by some as symbols associated with drunkenness. 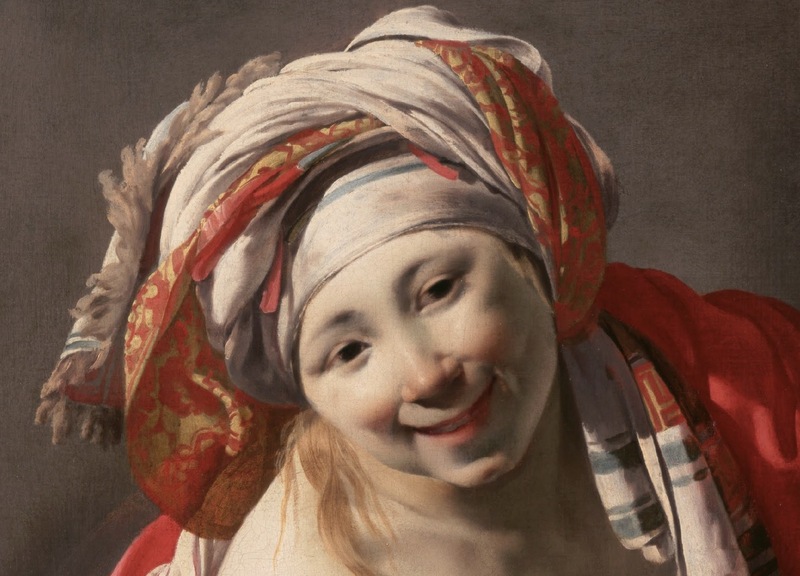 So this part of the painting is usually interpreted as a (negative) commentary on the main subject; the woman. Xrays have revealed however that Ter Brugghen added the table with the monkey at a later stage; perhaps as a clarification of the painting’s theme. Given that apes were seen as imitators of man, its meaning might also be that the viewer shouldn’t act like an ape imitating the vice of drinking. Yet somehow this line of thinking doesn’t feel very satisfactory as it this late addition makes the composition somewhat unbalanced (try to imagine the painting without the ape and the table); perhaps it was added on request of the buyer or critics who felt a painting like this needed a moral warning. It may not be the most famous (Dutch) painting, but once you have seen it, it is hard to forget. And that is all an artist can hope for.